Social psychiatry is concerned with the effects of the social environment on the mental health of the individual, and with the effects of the person with a mental disorder on his/her social environment. The field encompasses social interventions, prevention and the promotion of mental health. 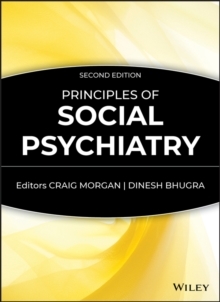 This new edition of Principles of Social Psychiatry provides a broad overview of current thinking in this expanding field and will be a source of ideas both in research and for the management of mental disorder. It opens by putting social psychiatry in perspective, within both psychiatry and the social sciences. From the patient's perspective, the outermost influence is the culture in which they live, followed by their neighbourhoods, workmates, and friends and family. The next section considers how we conceptualize the social world, from families through cultural identify and ethnicity to the wider social environment. The book reviews the social determinants and consequences of the major mental disorders before considering interventions and service delivery at various levels to mitigate these. It closes with a review of the social impact of mental illness around the world and a thoughtful essay by the editors on the current state of social psychiatry and where it is heading.